- Sad Sentences - Can you spot the fakes in Lemony Snicket's Sad Sentences? - 13 Shocking Secrets you'll wish you never knew about Lemony Snicket. - Great printables from A Good Day by Kevin Henkes! - Download fun activities from A Very Marley Christmas! - Print the activity sheet celebrating the Richard Torrey collection! - Amelia Bedelia is all mixed up, can you help unscramble her words? - Amelia Bedelia needs to get to the library, can you help her through the maze? - Learn how to speak Amelia Bedelia's mixed up language! - Print a set of Amelia Bedelia Bookmarks! - Print and color your own Valetines with Amelia Bedelia! - Learn to use big words! - Download these fun activities featuring Cat the Cat and her pals! - Help Charlie find his best friend in this maze activity, plus print his favorite lasagna recipe! - Find your way through Charlotte's Web! - Create your own comic strip! - Print your own Diary of a Fly bookmarks! - Help Fly, Spider and Worm through the maze! - Draw your day with a picture diary! - Send a postcard to Spider! - Play word games with Fly and her friends! - Help Emma find Dixie and her missing Ruby slipper! - Join the Shelabration with a downloadable event kit! - Help Duck make soup with this matching activity! - Help Max through this maze so he can finally relax! - Help Fancy Nancy and her team win the events during Field Day! 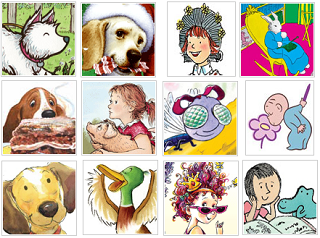 - Download great printables from Fancy Nancy and the Posh Puppy! - Create an at-home spa experience for you and your mom. - Play dress up with Fancy Nancy paper dolls. - Are you a splendid speller? Play this spelling game with Fancy Nancy to find out! - Print a set of Fancy Nancy stickers! - Coloring fun with Fancy Nancy! - Create your own paper collage! - Download great printables from Fancy Nancy: Bonjour, Butterfly! - Download this activity and event guide and explore the fancy side of life with Nancy! - Print out these fancy invitation for your Fancy Nancy Fashion Boutique. - Create your family tree with Fancy Nancy! - Download these activity suggestions for your very own poetry party. Everything's fancier when it's in verse! - Download these fun and festive Fancy Nancy activities for the holidays. - Connect the stars to help Fancy Nancy uncover the constellation! - Create a fancy solar system mobile! - Turn this scene from the book into your own colorful creation! - Practice counting with Goodnight Moon 123!